[Bangkok, Thailand] What sorcery is this?! I had come across many butterfly pea drinks with shades of blue and purple, but nothing that looks like this azure blue (Ok, I googled to find the exact term to describe this shade)! 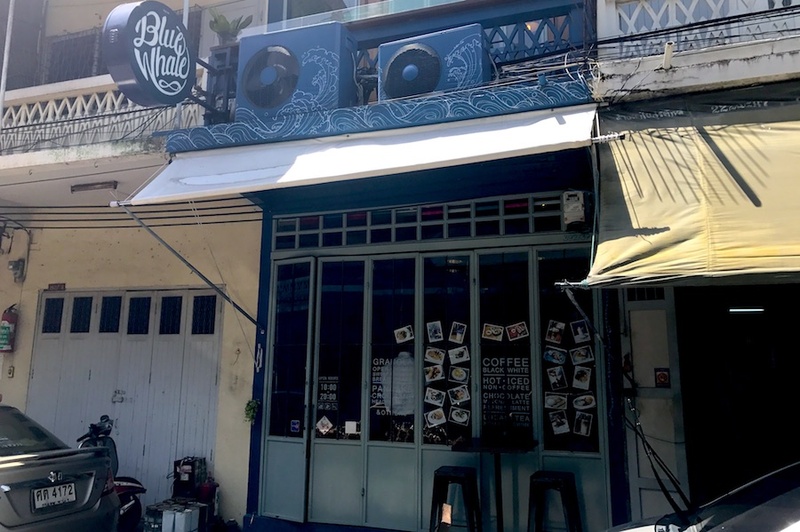 Blue Whale Maharaj or Blue Whale Cafe is located in the touristy area along Chao Phraya River, with The Grand Palace, Wat Pho (Temple of the Reclining Buddha), Wat Arun (Temple of Dawn) in the vicinity. You know, those places that you see on the postcards. 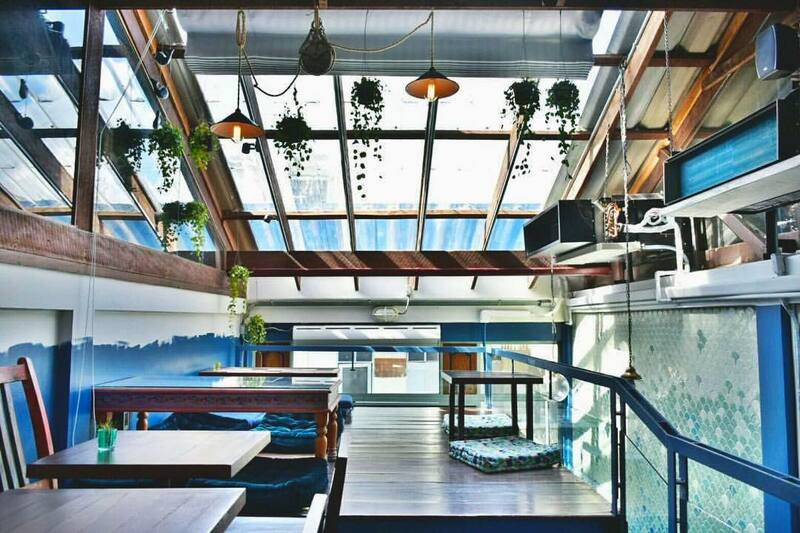 Dressed all in blue, you would find a 3-storeys high building painted in blue (THAT shade azure blue), with balcony seats at the second level overlooking the street below and window ceiling on the third floor for some sunlight. “Gorgeous”, is probably an understatement, especially when the coffee they made tasted and looked as good as the interior of the cafe. 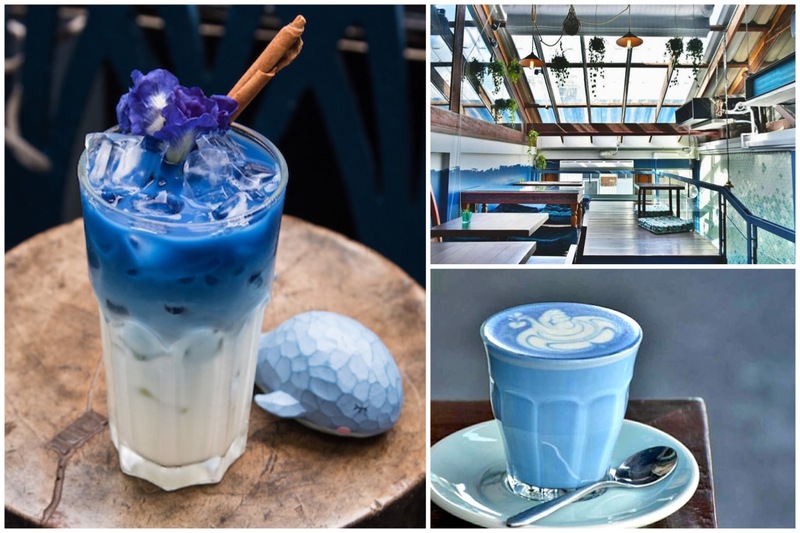 It was therefore not a surprise to see that blue coloured Butterfly Pea Latte (Hot THB90. 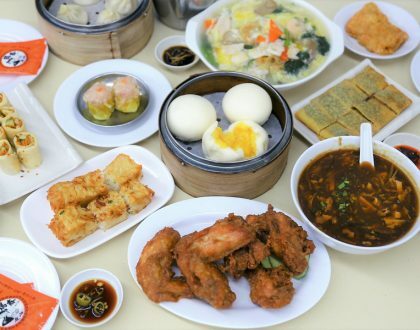 SGD$3.80/ Iced THB120, SGD$5) on every single table, that resonated with their interior. 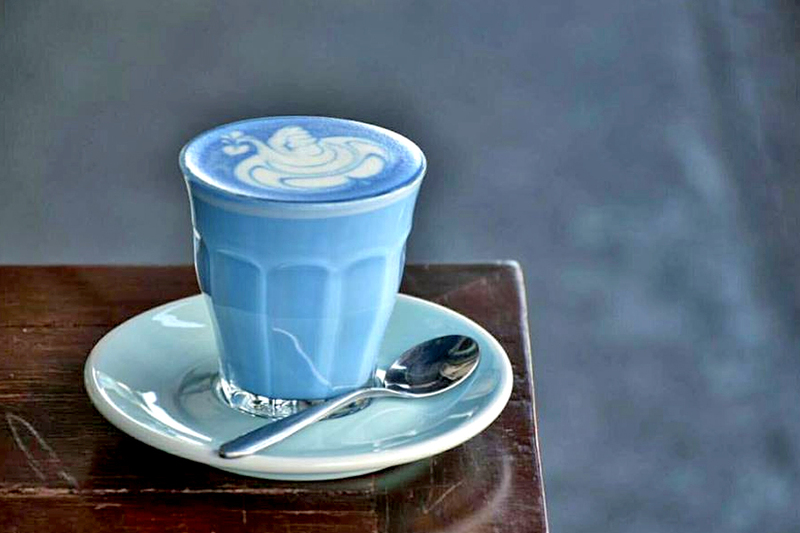 Even the latte art for the Hot Butterfly Pea Latte (THB90. SGD$3.80) was beautifully poured and crafted. 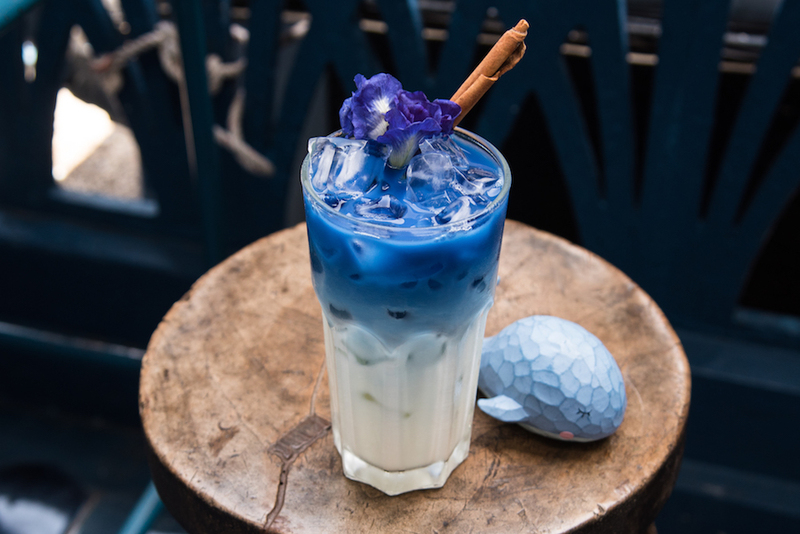 I had the Iced Butterfly Pea Latte (THB120, SGD$5) with a 2:1 ratio of butterfly pea liquid to milk, topped with a stalk of edible flower and a cinnamon stick. You took me right out of the blue…” I was deeply mesmerised by the shade of blue, so calm, harmless and peaceful-looking. 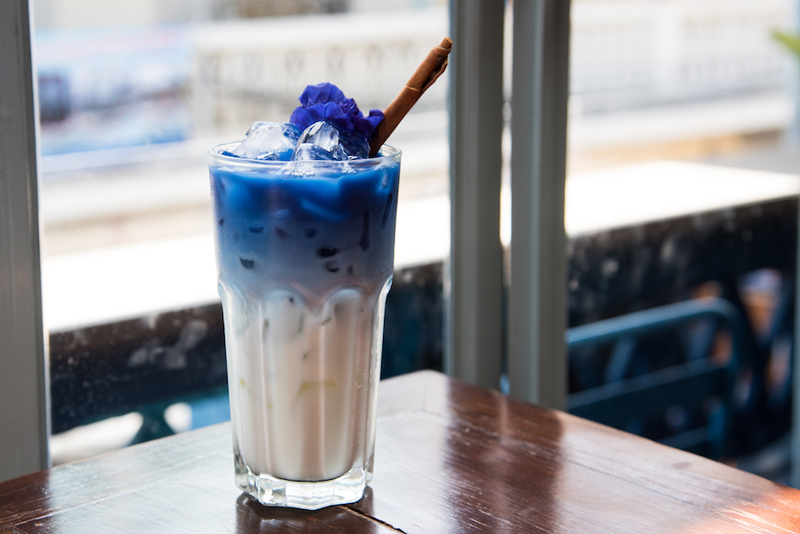 Well, the butterfly pea latte tasted more like milk with hints of cinnamon from the stick since butterfly pea was almost tasteless. 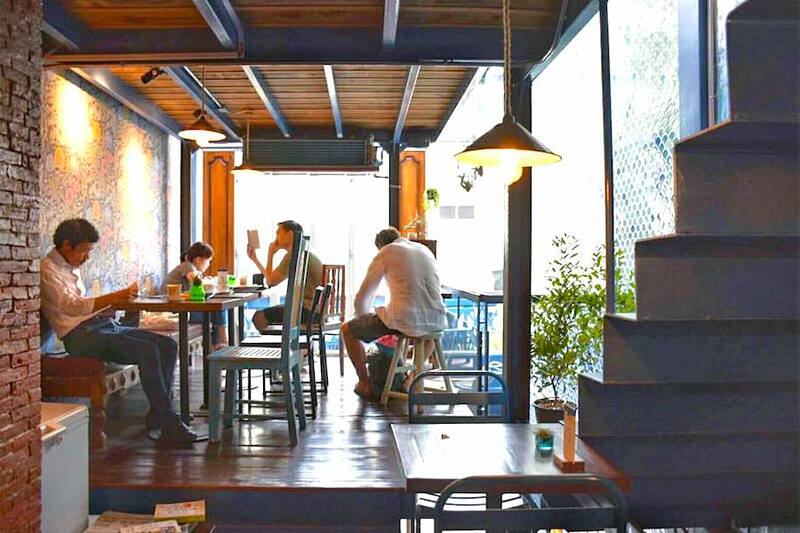 Apart from their signature Butterfly Pea Latte, Blue Whale served a selection of Open Toast such as black charcoal toast (THB180/200, SGD$7.60/8.30) and Cha Thai on the Beach (THB160, SGD$6.70). 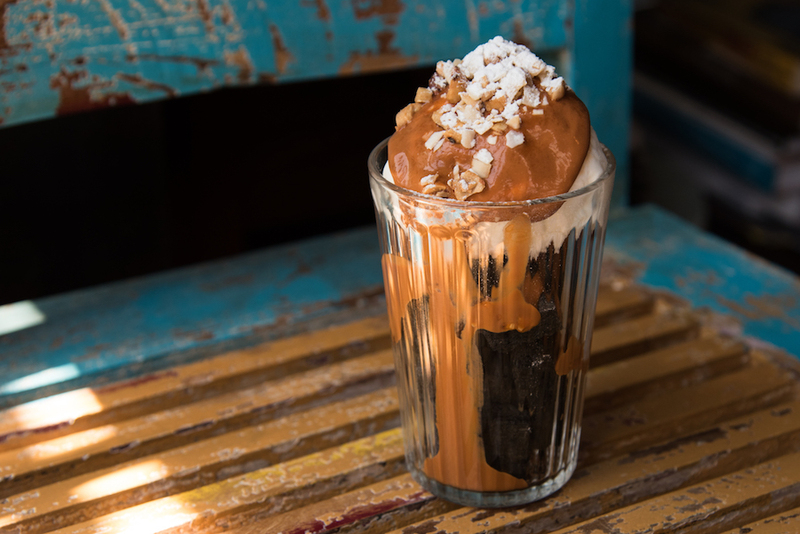 Cha Thai on the Beach (THB160, SGD$6.70) was made up of charcoal toast topped with a scoop of vanilla ice cream with Thai milk tea sauce drizzled on it. 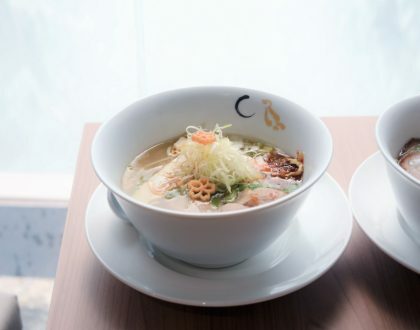 It reminded me of how I dipped my loti (“bread” in Hokkien) in teh-c (tea), but Thai milk tea in this case. 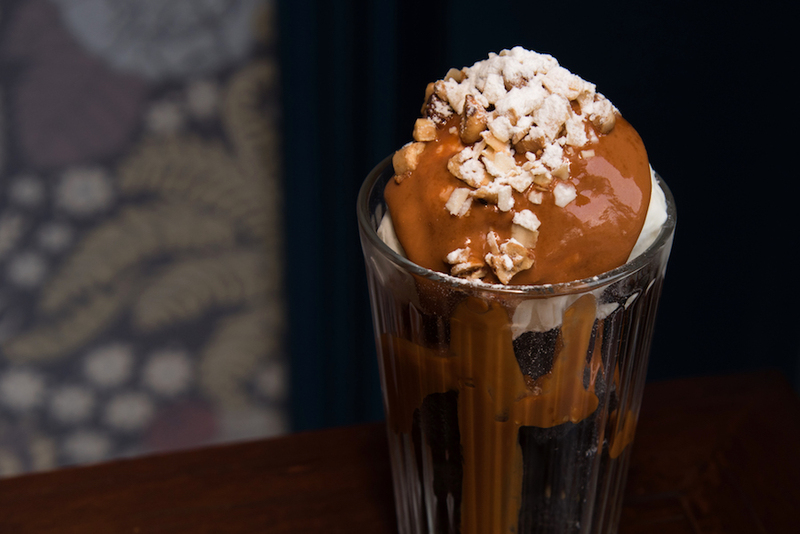 It would probably taste stronger if there was more sauce drizzled on it or a scoop of Thai milk tea ice cream was used instead of vanilla. 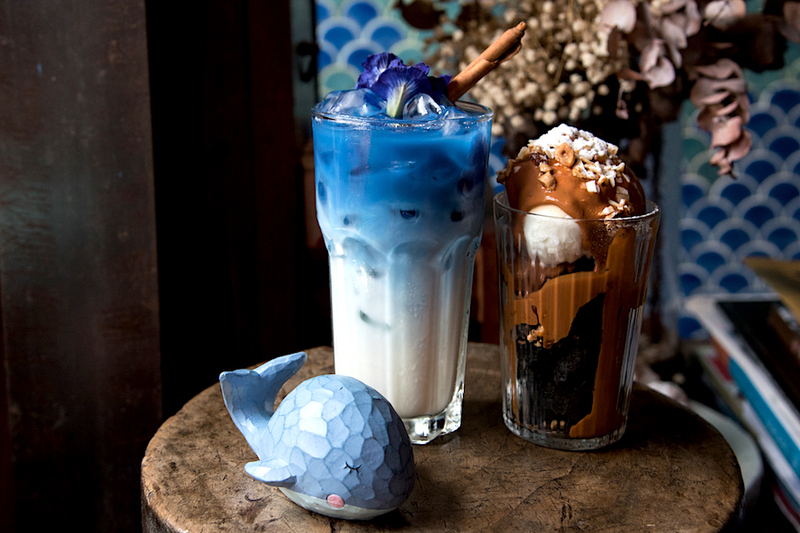 Whale you drop by Blue Whale Maharaj for that Butterfly Pea Latte? That is too cool! 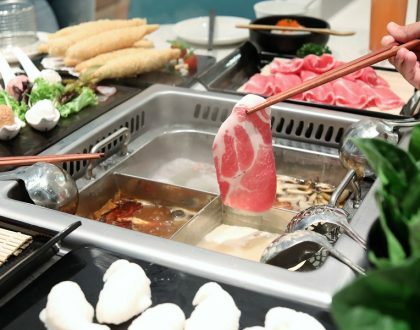 I’m definitely trying that! Thanks for posting about that!